I don’t know about in your house, but around here yams are the biggest hit for sides on Thanksgiving. What I love most about yams are all the different ways you can prepare them. 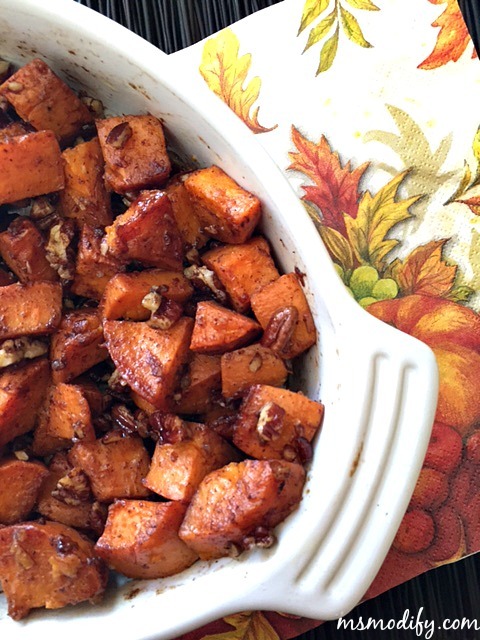 We always would make them mashed with a brown sugar pecan topping, but then I saw this recipe for candied yams and knew it would become an instant favorite in our house! Be prepared for these candied yams to melt in your mouth! Preheat oven to 350 degrees. Grease a baking dish and set aside. Put ½ cup of water into a pot over medium-high heat. Once water boils, places cubed yams into water to seam for 15 minutes or until fork can be inserted. Don’t cook completely; they will continue to cook in the oven. While yams are steaming, put oil, sugar, spices and pecans in skillet over low heat. Whisk together until sugar dissolves and mixture thickens. Drain potatoes and place in baking dish. Pour sugar mixture over yams and toss until all yams are coated. Place in oven and bake 30-40 minutes or until the yams are tender and brown. This entry was posted in Recipes/Dining Out and tagged holiday recipes, side dish, Thanksgiving, vegetables.